Need a stock pile of easy dinner recipes to add to your collection? Try some of these quick and simple meals on for size. I know first-hand how hectic life can sometimes get. Juggling a job, kids, extracurricular activities, a home and everything in between is more than enough to test your sanity. To help you keep your time in the kitchen at a minimum, and your sanity intact, I've put together a collection of the best easy dinner recipes I've come up with, both from experimenting and vegifying oldies but goodies from back in our meat eating days. What makes an easy dinner recipe? I have spent a lot of time in the kitchen over the past year and have tested lots of recipes out on friends and family. While most have gone over well, I've had my fair share of kitchen nightmares too (though you won't find those here). ALL the recipes you find here fit the above-mentioned criteria and ALL of them passed the friend and family test with flying colors, and they're great for everyday cooking or special occasions, no matter what you're in the mood for. I hope your family enjoys them as much as mine does. Be sure to come back and tell us what you think. 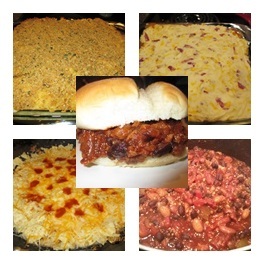 FYI: I add to this page often so don't forget to stop by and check out the latest easy vegetarian dinner recipes. Subscribe to our blog to be notified when we add new vegetarian recipes and meal ideas. This one gets a lot of use at our house. Absolutely delicious despite the fact that there are no noodles in it to speak of. It's much easier and much healthier than a traditional lasagna, and it always turns out fantastic. This super easy veggie burger recipe puts a fresh new spin on the classic American hamburger. They're light, filling and packed with so much vegetable and protein goodness that your family won't even notice there's no meat! This updated shepherds pie recipe is the ultimate one pot vegetarian meal. It's a tasty, well balanced meal full of protein, veggies and healthy carbs! Plus, learn a few simple tips to help you put your own unique spin on an age old family favorite. This homemade vegetable soup will have you wondering why you ever spent money on the canned version. Serve it with cheese and sour cream on top, alongside a grilled cheese sandwich or paired with your favorite crackers. Spaghetti with a twist! Next time you're in the mood for classic Italian, try this vegetarian baked spaghetti recipe. It's full of flavor and layered with mozzarella or Italian blend shredded cheese. Ultra simple and a definite crowd pleaser.